If I had a dime for every time a friend said, “The Big Bubba is back!,” I could buy one. When Bayleaf Bar & Grub, the former Main Street watering hole/all-night eatery, closed its doors in January, it created a void in many an inebriated person’s stomach. Thankfully, the Bubba—a massive stack of biscuits, fried chicken, egg and gravy—is back, and the former Bayleaf owners have a few more smokin’ culinary tricks up their sleeves at Campfire Lounge in Sugar House. Campfire Lounge also offers Bayleaf’s signature chicken & waffles, but the menu is more representative of owners Haylen LaTorre and Seth Radford’s love of the outdoors. 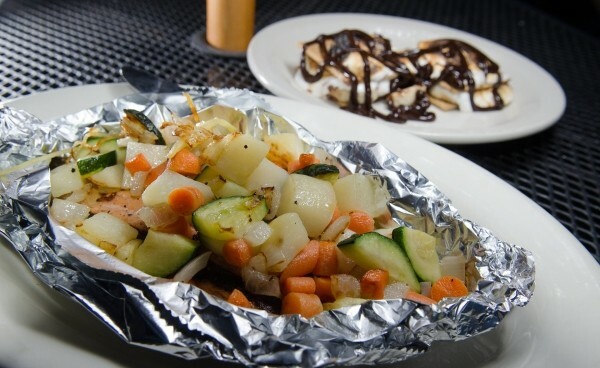 Taking cues from quintessential backcountry recipes, Campfire’s menu includes hobo pies (aluminum-foil-wrapped pockets of meat and veggies) and s’mores. I should be so lucky to ever actually catch a trout while camping, so I ordered the trout hobo pie. The veggies remained firm, yet well cooked, and the trout was flaky and savory, but the pies are cooked in an oven, so there’s no smoky edge or delightful almost-char that happens when cooking over a campfire. The s’mores with Nutella and banana were delicious—dare I say addictive—even though much of the fun of eating s’mores is making them; there’s a delicate science behind perfect marshmallow toasting, and every camper has his/her own way. With its camping-inspired nosh, Campfire Lounge has found a wholly unique niche in town—although the owners say they consider it a neighborhood bar first and a restaurant second. To enhance the camp-meets-bar vibe, they envision acoustic musicians strumming singalongs by open pit fires on the patio in the future. Maybe they’d let me roast my own marshmallow then.